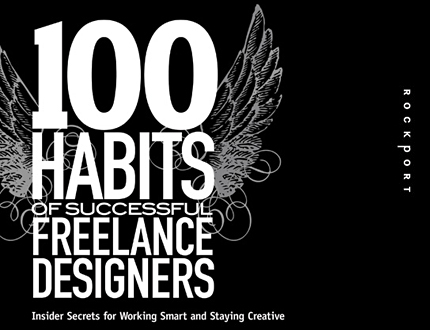 Several of my tips and my work will be included in a new book about freelancing, "100 Habits of Successful Freelance Designers: Insider Secrets for Working Smart & Staying Creative," published by Rockport and authored by Steve Gordon, Jr. with Laurel Saville. Good habits are found in every part of the design process, from promoting yourself well in order to land the client, to working with that client, to achieving the desired results on press. "100 Habits of Successful Freelance Designers" reveals solutions from a wide range of freelance designers whose years of experience have helped them find not only the most creative solutions for their clients’ design needs, but also the most successful solutions. The book also focuses on the daily habits that inspire these designers to stay creative, and business strategies to be successful when working on your own. Steve Gordon, Jr. has been a professional graphic designer for the better part of a decade. He’s run the full range of the career path with experience from in-house design at internationally recognized Fortune 1000 companies, agency and studio work, to now working as an independent designer and creative consultant, RDQLUS Creative. He frequently lectures on how small studios/freelance designers can stay competitive in the design field at conferences such as the HOW Conference. Follow @mayhemstudios and @RDQLUS_Creative on Twitter.